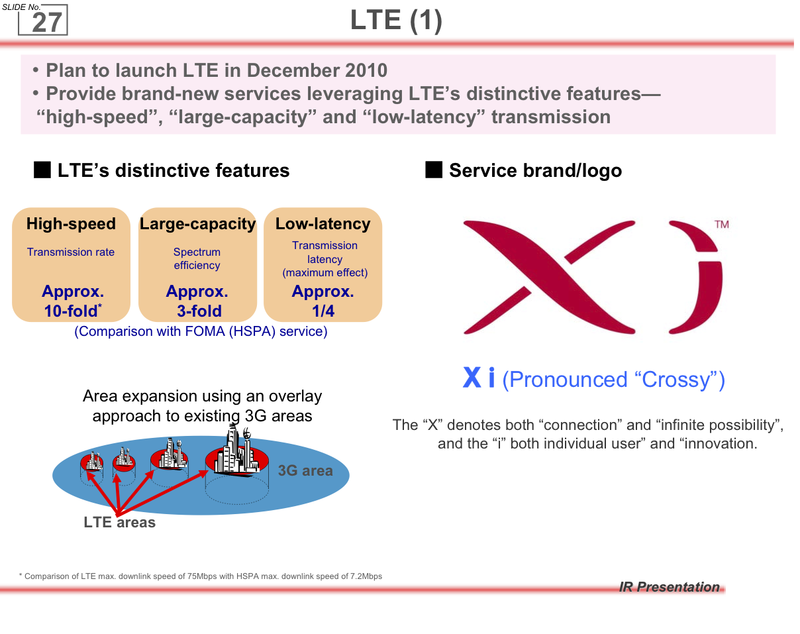 Docomo's "Xi" (Crossy) LTE service will start in just a couple of months, yet we have not heard anything about what types of phones will be available. Given that Docomo waited to officially announce the Galaxy S until one week prior to launch, and any announcements could diminish second quarter sales, I bet we won't hear too much any time soon. However, more details about the service are starting to creep out. The following are three slides from a recent Docomo presentation (PDF). And we also now have more concrete information on their expansion plans. In just two months, Xi service will be switched on in Tokyo/Nagoya/Osaka, covering nearly 10% of the population by April 2011. That amount will double by April 2012, and double yet again by April 2013, with a projected 40% of the population covered by LTE with maximum indoor download speeds of 75 Mbps and 35 Mbps outside. 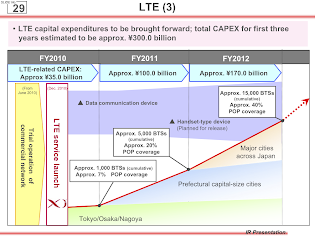 The other carriers on the other hand will have just started LTE service at this point, likely with the exception of softbank who has not announced a timeline for roll out. So for me, I am in no rush to pick up the latest and greatest handset until I see what LTE offerings are around the corner. I don't really see much need for LTE on handsets, specifically. Current speeds seem more than sufficient for streaming the kind of stuff you'd want on a smartphone. My guess this is really about mobile networking writ large. I bet they'll be offering high-capacity data plans for notebook users, commercial contracts where NTT supplies mobile connectivity for entire companies, that sort of thing. 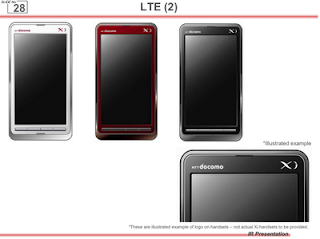 LTE phones are, I guess, mostly a sideshow. I can certainly see the appeal for LTE modems. I understand where you are coming from, but I don't quite agree on the sideshow aspect wrt handsets. 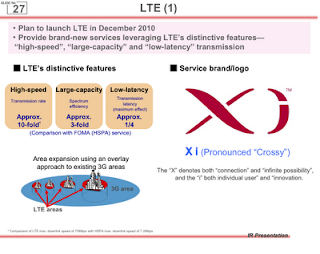 LTE is provide much lower latency, which would improve voip. Browsing can be annoying slow on 3G, even when I am getting well excess of 1000 kbps. I much prefer doing it with wifi. 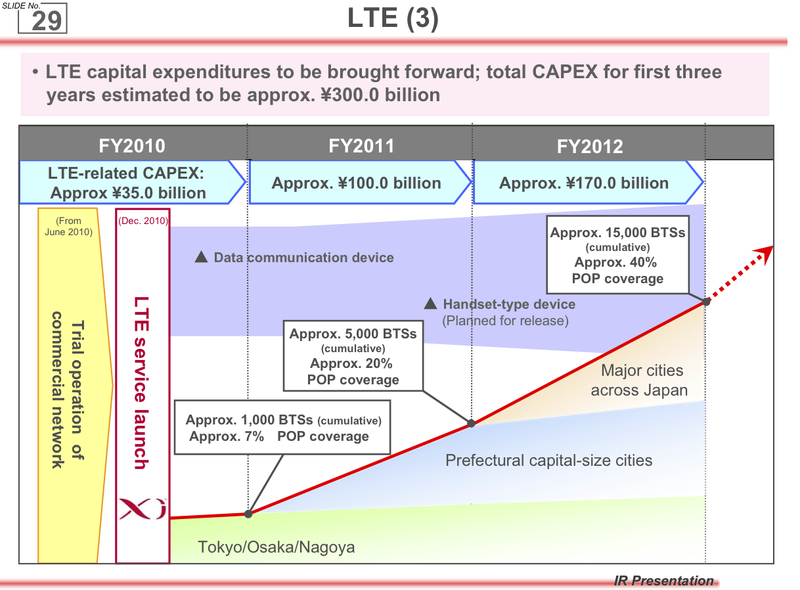 But either way, down the road, just like 3G replaced Edge, etc., so will LTE here in Japan. "64Kb of memory should be enough for anybody"
I think the largest benefits LTE provides for carriers is it is more spectrum-efficient. That means instead of building more towers to accommodate a growing smartphone market, they just have to upgrade to a more efficient protocol. also convergence from CDMA2000 (au KDDI) and W-CDMA (DoCoMo, SoftBank) to a single standard, provided they can agree on one. 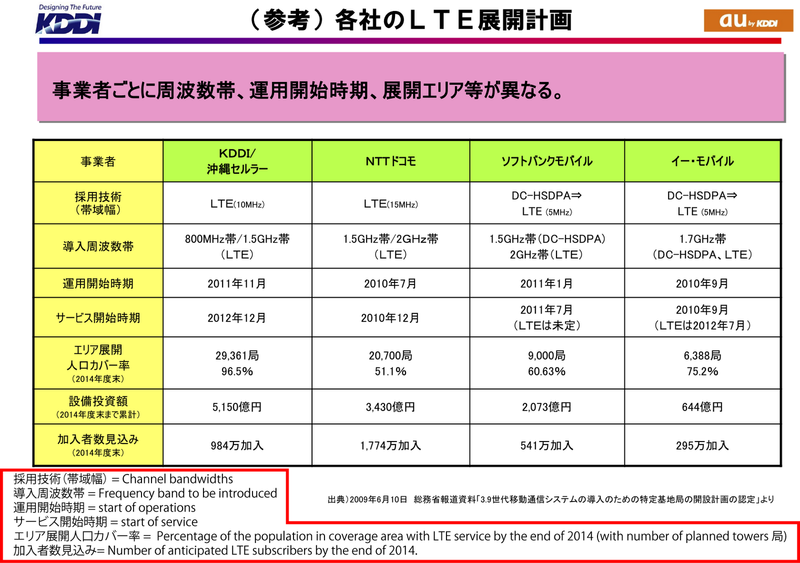 For the time being, KDDI I believe intends to continue using CDMA-2000 for voice but LTE for data, which is the reason they gave for being against SIM unlocking.